Although 800 years old, the two copies of the Magna Carta in the exhibition aren’t, in themselves, impressive. One was damaged by fire in the 1700s, then brutally ‘restored’ by an incompetent Victorian, so is completely unreadable. The other is a piece of parchment about 60x40cm covered in small dense text – no seals, no illuminated letters, no pictures (see above). And a great deal of the content is unimpressive as well – the removal of fish weirs from the Thames and the Medway, a clause saying that no town will be forced to build bridges over rivers, and a great deal about inheritance rights. So what is it that gives Magna Carta its reputation as a cornerstone of freedom and democracy? Probably the most important thing about the Great Charter is not any individual clause (although “To no one will we sell, to no one deny or delay right or justice” still has the power to make one breathe a little faster), but the concept that no one – even the people who make and administer the laws – is above the law. That belief in the ‘rule of law’ is fundamental to how we view our democracy. But as Simon Schama put it, Magna Carta was not “the birth certificate of freedom, [but] it was the death certificate of despotism”. And of course “democracy” wouldn’t have been a concept in the minds of the barons who forced King John into accepting the terms of the Charter. Their aim was to control the arbitrary exercise of power by the king; John’s aim was to buy time in his war with the barons after suffering several reverses. Because almost immediately after agreeing to Magna Carta, John repudiated the document, triggering a civil war and an invasion as the rebel barons invited Prince Louis of France to take the English throne. It was perhaps John’s death in 1216 that consolidated the charter. His heir was the 9 year old Henry III whose regent, William Marshal, ended the civil war by agreeing terms with the rebel barons that incorporated most of the 1215 conditions into a new charter. Without this, it is entirely possible that the original Magna Carta would have become almost entirely forgotten; a small footnote in the medieval power struggle. As it was, Magna Carta wasn’t much referred to from the time of the Tudors until Edward Coke revived its core meaning – that the Crown is not above the law – in the 17th Century turmoil between Charles I and Parliament that became the Civil War. Coke viewed Charles’s actions in demanding ‘forced loans’ and in imprisoning parliamentarians without due process went beyond the authority of the monarch, and he drafted the 1628 Petition of Right in an attempt to curb these excesses. 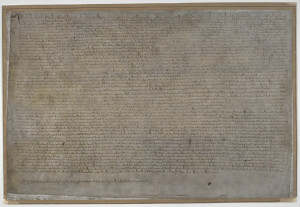 The Petition made specific reference to Magna Carta, so when the American colonists drew on the Petition of Right and the Bill of Rights for legal arguments in their dispute with George III and the British Government in the 1700s, so Magna Carta became entwined with their constitutional demands. 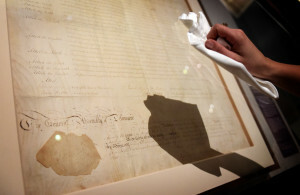 The British Library exhibition has Thomas Jefferson’s handwritten copy of the Declaration of Independence and one of the original copies of the US Bill of Rights, both on display in the UK for the first time. The US emphasis on a written constitution is probably the reason why Magna Carta seems to be a more venerated document there than it is here. It also helps explain why the memorial at Runnymede was funded by the American Bar Association and was created as late as 1957. As usual when it comes to history, the team at Horrible Histories tell it best. Here’s their take on Magna Carta (which you will also find in the exhibition). 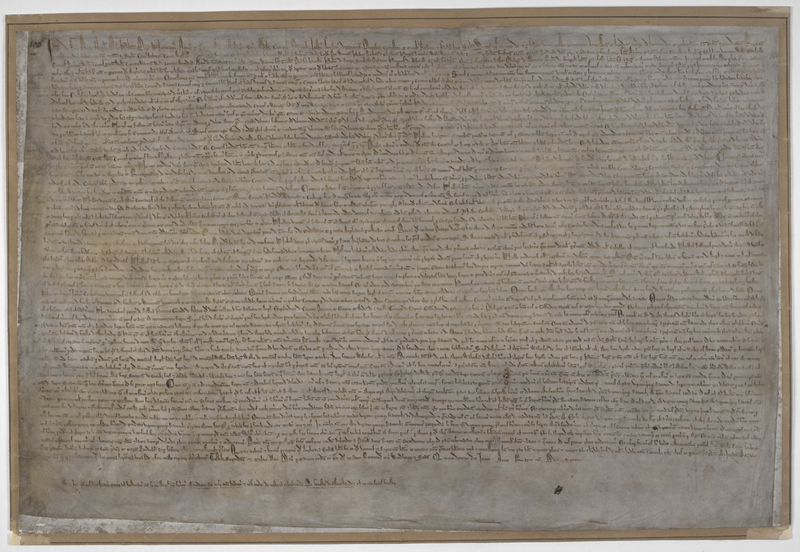 Magna Carta – Law, Liberty, Legacy runs until 1 September at the British Library. Other events can be found here and the British Library’s introduction to Magna Carta can be found here. *this was my first freebie as a blogger – other invites welcome. Or cake. I’ll definitely write for cake. This entry was posted in exhibitions, The Blog and tagged british library, magna carta on 07/04/2015 by donbrown.